Yvonne is a LIRF qualified Run Leader and qualified guide runner for the visually impaired. 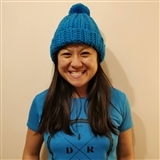 Co-founder of Didsbury Runners and run leader at the University of Manchester, Yvonne regularly leads group of varying ability on road and trail. She is also a parkrun enthusiast and run director.